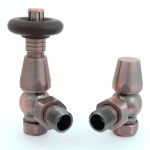 The Bentley is a traditional radiator valve which you can control the temperature of your radiator. Part of our cast iron radiators collection. There are many Cast iron radiators in our collection that will look superb combined with the Bentley Radiator Valve.